The Celtics came out on top in Wednesday’s photo-finish contest against the Knicks, but their superstar point guard Rajon Rondo went down in the heat of the battle. Rondo rolled his left ankle in the fourth quarter and will be out of action for a couple weeks. 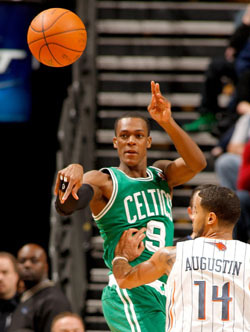 Rondo leads the league in assists, and he’s second in the league in steals. How will the Celtics fare with their playmaker on the sidelines? Do you think Boston will be able to hold on to the number one spot in the East without him?